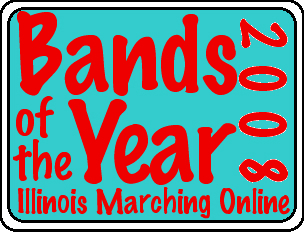 This is the ballot for Illinois Marching Online’s 2008 Bands of the Year voting. While the ballot is public, voting is carried out in private, and neither the names or the votes of any voter will be revealed. Members of category #4 who are voters must be of such recognition that a reasonable person would see them as at least as qualified as a Current Illinois Band Director to vote in this poll. Such individuals would include, for example, judges who reside within Illinois or who judged many Illinois contests this season. No High School students may vote, for any reason, in this poll. Please go through each of the following Divisions. Select the required number of bands in each division who you feel most embody a band with strong musical, marching, and general effect/showmanship in their 2008 performances. After selecting those bands, please rank each division. You must vote for the requested number bands in each division, or your ballot will not be counted. You must consider a band’s field show in your voting. You may consider parading performances as well, but such is not required. Do NOT consider past year’s performances or placings, including past Bands of the Year, when making your decision. The ballot is made up of all bands attending either the U of I Field Show, ISU, or BOA Grand Nationals competitions in 2008. However, you are welcome to write-in a band that did not attend these competitions, so long as they performed a field show in Illinois in 2008 (this includes non-competitive bands). Please check the school’s enrollment at IHSA.org before sending in a write-in vote. E-mail your votes to ilmarching@ilmarching.com by November 23, 2008. You may also submit your vote to ilmarching via Personal Message on our message board, but only if we know what school you are affiliated with. *Bands that made the 2007 BOA Grand National Semifinals are automatically included in Division I.